The theme of this release is improvement. Our development team have been making improvements and enhancements across the diary to ensure all users have the best user experience. Restaurant operators now see Pre-Order items for each guest as grouped (where ‘menu items’ are the same with the same ‘cooking modifiers’ and ‘optional extras’). 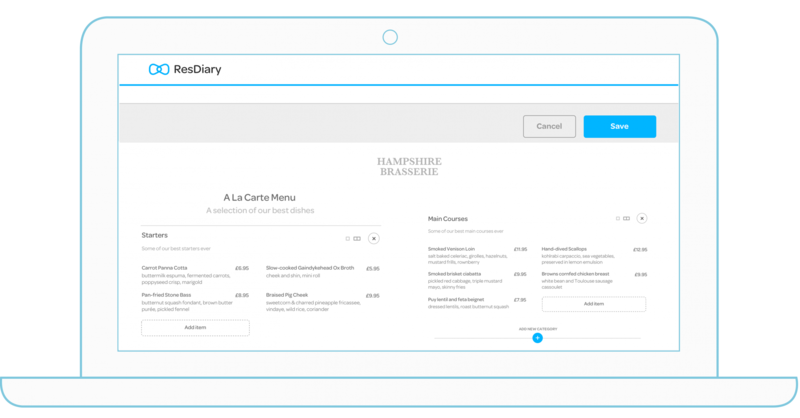 Restaurant operators with multiple venues, are now able to easily share menus across these venues, so that they do not have to re-create each menu repeatedly. Restaurant operators now see the surcharge price field (and not the menu-item price field) when viewing/editing ‘Set’ menus. Now, If a Pre-Order host invites a guest to edit their own order, when they choose to update their ‘name’ details, this now is reflected on the order. We have implemented a series of Actions required to get restaurant microsites showing on the Google Knowledge Graph. Enable Microsite ‘Search. We have made booking buttons active to help ensure that microsites are picked up as an active booking channel on the Google Knowledge Graph. We have removed ‘Edit Reservation’ pages from search to ensure that users always find the correct microsite page when searching on Google. 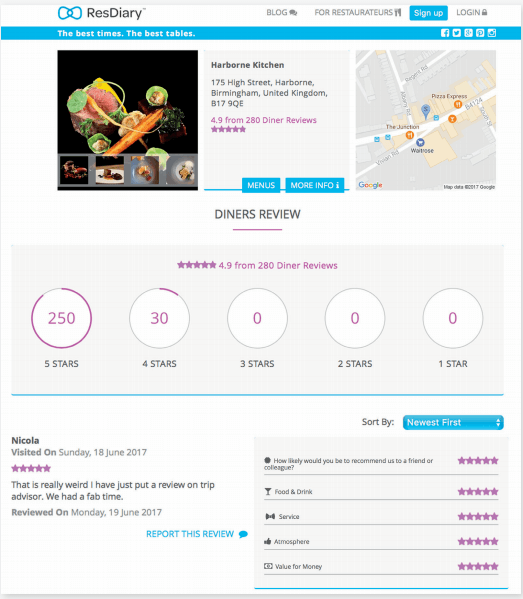 Microsite Reviews amount increased to help improve the ranking of a restaurant’s microsite on search engines. Uppercase URLs now redirect to lowercase versions automatically. Google Analytics have been added to the diner signup page so we can track sign ups. Add EPOS check items: Data extraction api consumers can now extract epos receipt xml, via the ResDiary api, so that they do not need to rely on the source EPOS system for the data. Data Extract – Add Booking Duration: Data extraction api consumers can now get additional information, relating to a booking end time, so that they can create reports on booking seat duration. Allow customer details [email address] exception by channel. Fix Static Maps to use Signature: Google maps access requirements have been scaled to meet the demands of the ever growing ResDiary customer base. Database query optimisation has been carried out to ‘significantly’ improve the speed that ‘App Marketing Lists’ load. In the NBP the edit buttons will now be renamed in the spider. Hovering over the ‘Booking Spider’ buttons now shows: ‘Edit (Old Process)’ over the Old Booking Process Edit icon. ‘Edit’ over the New Booking Process Edit icon. Update Stackify in Cach: Resdiary Application Performance Management tools have been upgraded to facilitate proactive/identification of application performance issues. Provider move fails to delete group if it is associated with a booking agency: Groups, that are associated with a booking agency, are now deleted after a sole provider is moved from its group.